I’m on bus duty and I’m freezing at the parent pick up area. It’s almost the end of my bus duty weeks, and I’ve been watching. I watch as kids walk down the path. I see kids in groups, loud and laughing. I see kids arm in arm with friends, and kids walking alone. I see kids smiling, kids weighted down by backpacks or bags of library books. I see kids looking concerned and kids just concentrating on leaving. A few of my current 6th graders wave a quick goodbye to me, as they scan for their parents. I catch the eyes of 7th and 8th graders who used to belong to my classroom, and call them by name as we say goodbye. It feels good to know these kids. My teacher ears pick up snapshots of conversations that are happening in small groups that assemble around me. One group gets loud and obnoxious in an unsettling way: a playful push here, a throwing of leaves, an inappropriate remark that almost crosses the line, but did I really hear it correctly? I move myself closer, and wonder about the rules. In school, you can’t call someone a loser. It’s not okay to make inappropriate jokes that make others feel uncomfortable. “Your mama” phrases aren’t tolerated. In my classroom and with the students I interact with, I try to make these learning experiences. I don’t want to bully you into not bullying – I want to help you move towards kindness. On bus duty it feels different. I don’t know these kids – not even their names. I don’t know what norms they have settled on in their 8th grade hallway. I know that it has always seemed looser, as if the 8th grade teachers know to let the 8th graders spread their wings. But unkindness is hard for me to hear without intervention. In school, you can’t have your cell phone. As soon as the bell rings, students walk out the door, cell phones out. By the time they get down to parent pick up, they have already texted and instagramed, tweeted and occasionally even called, to their hearts content. Groups of middle school students stand with phones out, having conversations with the people next to them and the world at the same time. I am unsettled by this, but is it against the rules? Don’t I tweet and text and read on my phone when I’m bored? 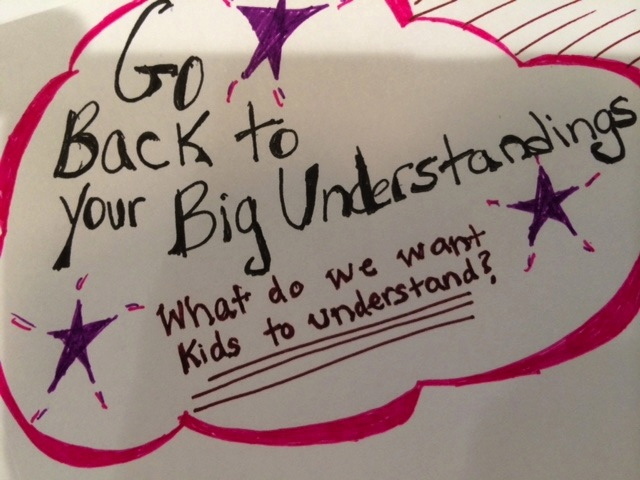 Don’t I think think that kids deserve to feel connected? I know so many benefits of connection and technology, but I feel like I’m watching the introduction to a real life Wall-e, where students are connecting only through this device, and not with the people right next to them. I’m on bus duty, and I’m watching. I am trying to make sure you are safe but I think I may have failed. I see you walking alone, and I see you navigating your friendship groups. I see you telling loud obnoxious jokes, and I see you look at me wondering what right I have to intercede. I should have introduced myself to you and your friends and found some common ground. 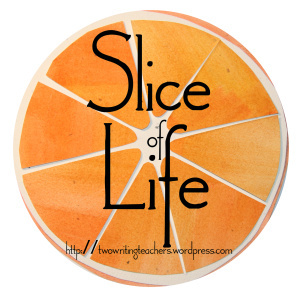 Instead I reverted to my early teaching days – when I had 8th grade lunch duty and 8th grade study hall. When I didn’t know what I was supposed to do so I just became an enforcer. “That’s not okay.” I say as you throw leaves at the girl next to you. “She doesn’t mind.” you tell me with the air of defiance playing on your face. “Well I do. So, stop.” I say. I can tell my eyebrows raise into my teacher face. And that’s all I’ve got on bus duty: an eyebrow raise and an enforcing “Stop.” I’m on bus duty and I’m freezing at the parent pick up area. It’s almost the end of my bus duty weeks, and I’ve been watching. 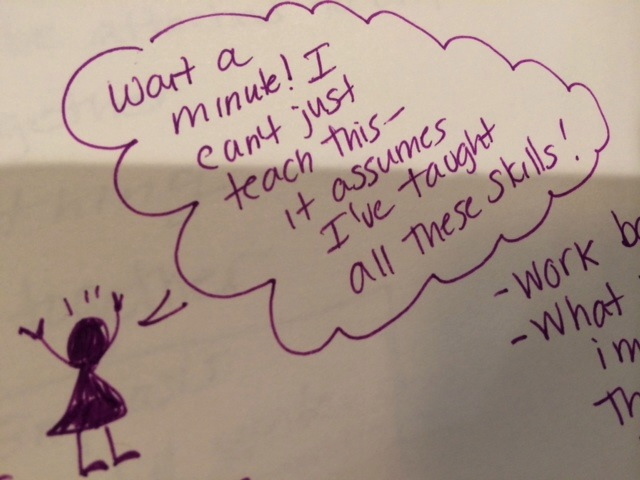 I shouldn’t admit this way I sometimes plan, especially after the brilliant day of curriculum writing I just had with Jessica Hockett and Catherine Brighton, and the K-6 ELA curriculum committee. 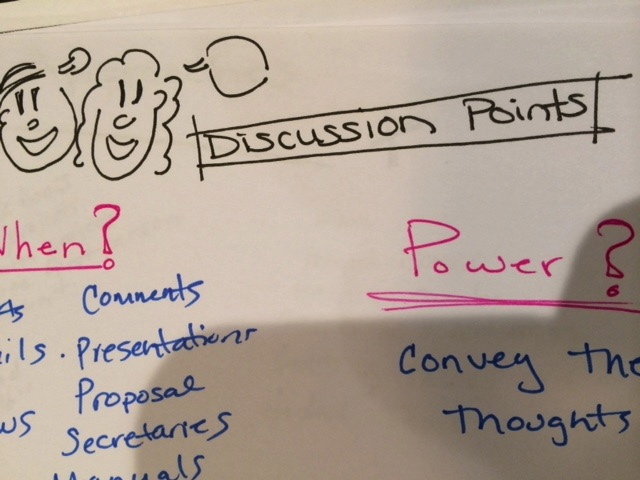 True confession: Sometimes ideas just sit in my brain for a bit, stewing. I see something a student did, and then I see an idea pinned on pinterest, and then those ideas mix around with things I think are fun, or authentic, or better yet both. So I google, and take notes, and think. And then suddenly in the middle of the day, the idea pops out. It’s done, and ready for the kids to try. That’s what happened with Visual Notes. I saw pins like this, this and this. I watched this. I thought about the work we have been doing with wonderopolis, with noticing our thinking before, during and after reading, and I decided it was time to give it a try. So I ran with it. I explained Visual Note Taking by taking visual notes about visual note taking. 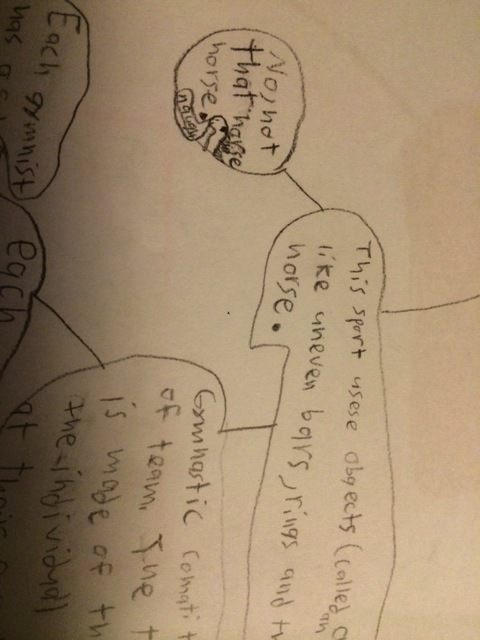 (Wish I had a picture of this – but it talked about visual notes being like mind maps, a way to organize information, and not about our drawing skills.) 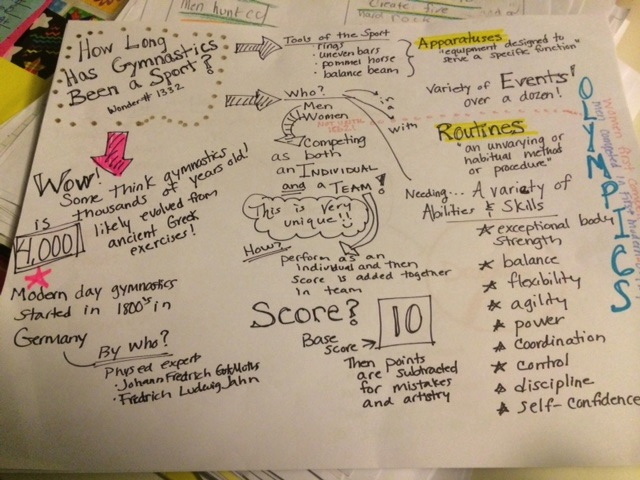 We jumped in with Wonder #1332: How Long has Gymnastics been a sport. I did the activity with the kids, and loved how I could use my whole page, and my fun pens. I showed my example after we were done working and was happy about my information. I shared with my class that I wished I had been able to use some of the cool drawing ideas I had seen on pins like this and this. I also hadn’t left enough room for my own questions, and it just wasn’t as awesome as I wanted it to be. I was impressed by my students’ work. Some were words only, organized in bubbles like a web – but still great notes. 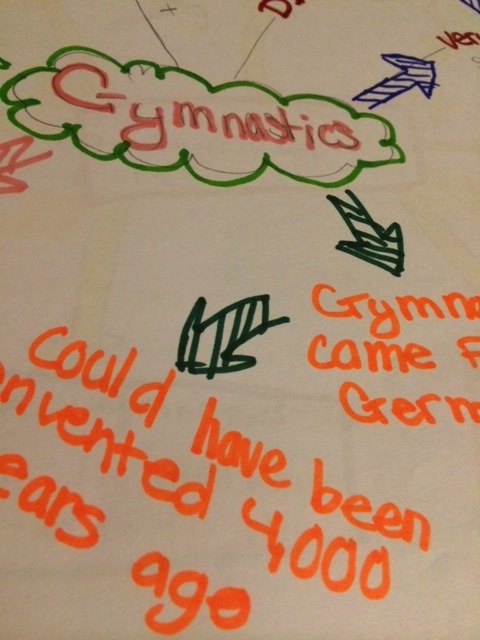 Others added pictures to organize things like the different tools gymnasts use. All of this led to a great conversation about how these notes were our own thinking put together with the author’s Wonder. 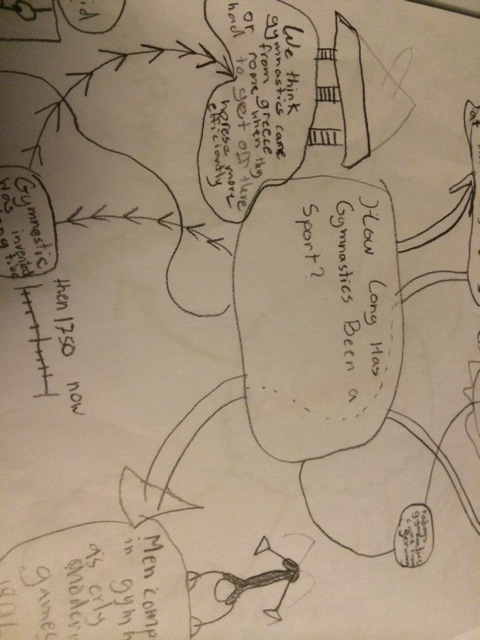 I could tell that students were getting ideas from the notes we looked at together. My other reading class assessed my visual notes before beginning their own. 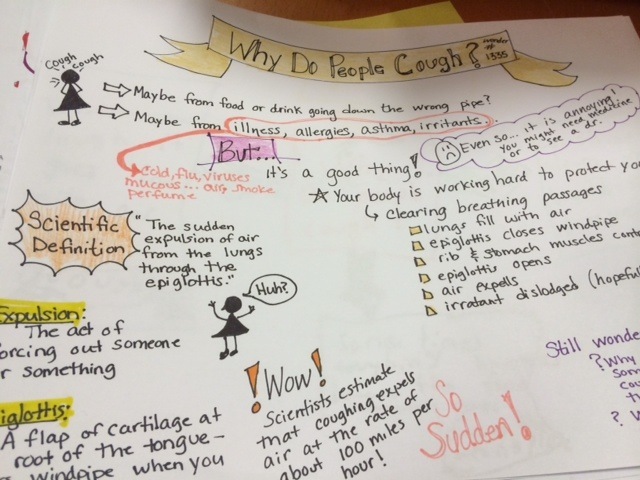 I did their wonder with them as well: Wonder #1335: Why Do People Cough? This time, my second time through, I was able to use some of the techniques I had been wanting to try out. My second try is nowhere near perfect. But, it is an improvement. I added color, and a few of my own thoughts. 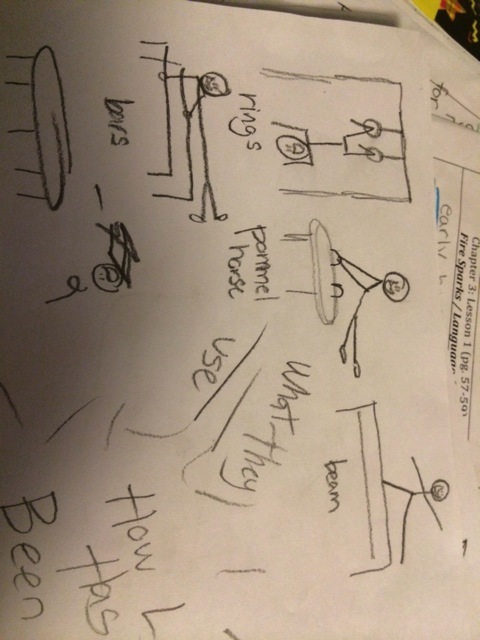 I even used stick figures to emphasize. Me: Okay, I have a crazy idea, so stick with me. 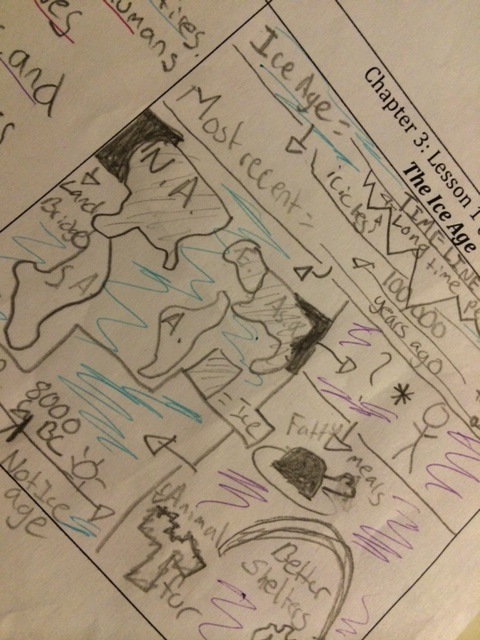 . . Let’s take collaborative visual notes on the Neolithic Age! yada yada yada, directions, discussion, etc…. Student: Wow, Ms. Thought! You said this was going to be crazy, but you never said it was going to be crazy cool! 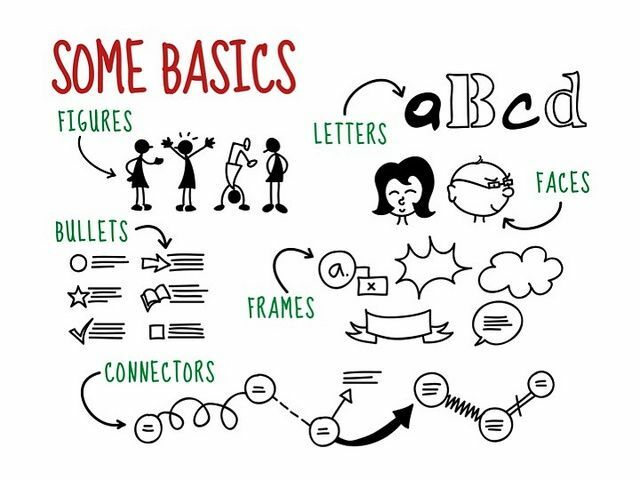 Kinda like they already knew how to do this visual notes thing! 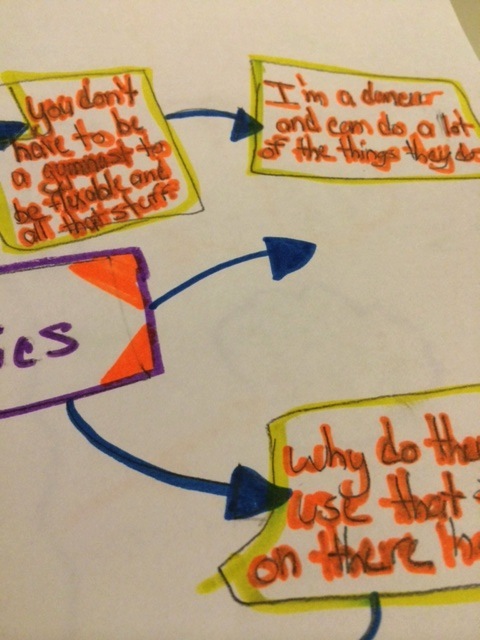 Since I started this mini unit on Visual Notes in my classroom, I have continued to read about the concept. 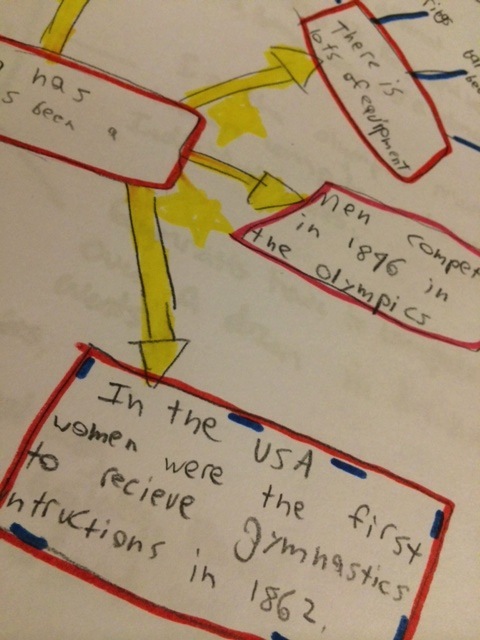 It feels right, yes, but I also know that it is helping students sort out all the information they are reading, and combine it in order to design their own understanding – in a fun and creative way. I love that they are practicing this tool! 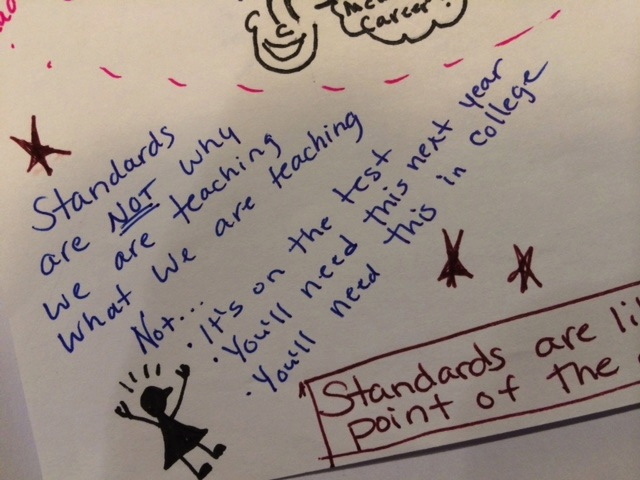 Today in my curriculum development session, I decided to practice my own visual note taking with a live speaker. Whoosh! It was engaging, helpful, and fun. I’ve always enjoyed doodling, but honestly couldn’t tell you if it helps or hinders my listening skills. 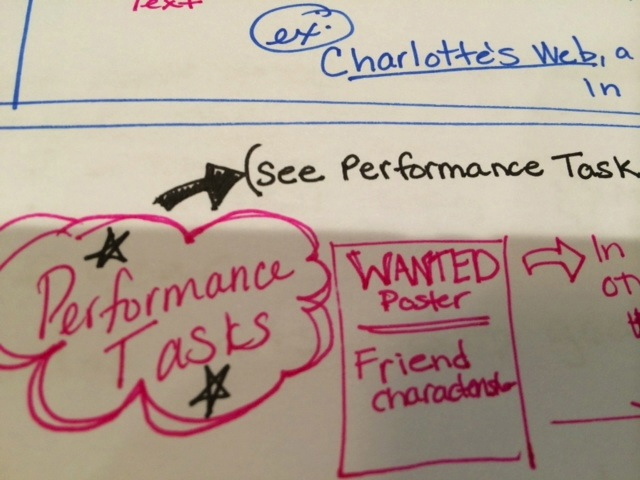 But today, with the visual note taking? It helped my understanding and my ability to synthesize the take away points. I can’t wait to try it again in my teaching and my learning. My drive to work is the same, more or less, every day. How rushed my morning is, and what time I leave dictates which way I start my trip, but the last leg is always the same. On rushed, bad days, I race out of the house. Guilt trails me down my front steps after I hurriedly give my kids their kisses and hugs, and I speedily remind my husband of a few last minute things. Guilt follows me into my car and reminds me of the stretching out of that connection to my family as I drive farther away. I distract myself with the radio and then halfway to school my mind starts filling with my school to do list. On good days I have a little more time with my kids, and I give a few more hugs and kisses. Some days, my kids walk me outside and run on the sidewalk as I drive away. Guilt is still my company on good days, but I’m more comfortable shutting her up. Now I notice school bus goodbyes everywhere on my morning drive. Parents wait in cars with their kids at the bottom of long country driveways, and parents walk back after busses have pulled away. If only I could leave school in time to see busses pulling up again, and kids hugging their parents hello! I think that might be good for my soul. Today I’m celebrating small stuff. These busy days with my messy house, and my candle burning at both ends, celebrating the small stuff is a good way to keep myself from sinking! When I can, I’ve been writing these small things in a note on my phone. I miss a lot, but love even having just a few there to remind me to celebrate. Recently we took a short detour and drove the kids to the spot where we got married. 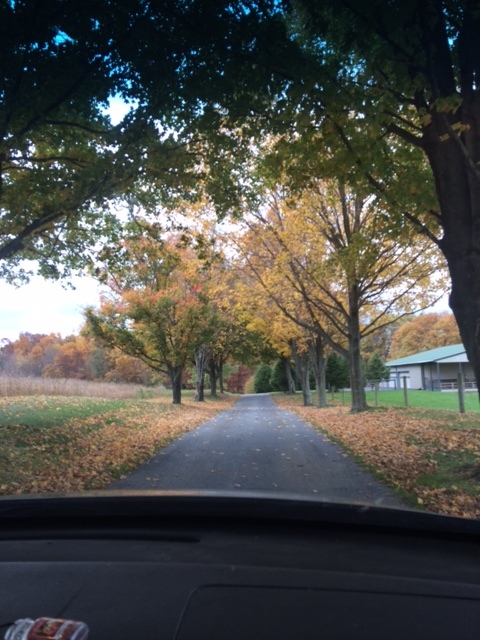 It was so beautiful, driving down the tree lined drive and reminiscing about our wedding day. On that same drive, L sat in the back seat crocheting. She has a bag of crocheting now, and when I look over at her crocheting, it’s hard to describe the peaceful feeling. I’m celebrating her craft, her mindful time, her practice. The note on my phone that says “the patient people as H experimented with the pumpkin scale.” I celebrate patience, and hope that I get more of it myself. The pumpkin scale line was long, and the man in charge was so kind. He joked around with my 7 year old, and didn’t mind H’s experiments with making the pumpkin weigh more or less by lifting it up, and pressing down on it. When people are kind to my children as they act like the curious young people that they are, I celebrate. When people don’t rush them, I celebrate. When people make them laugh and feel connected to this big crazy world, I celebrate. Game night. Sometimes the house is straightened up enough, and the vacuuming is done, and dinner is over, and pajamas are on. Sometimes kids take turns picking the game and everyone has a chance. Those times are worth celebrating.